Authors: P. Pietrukowicz, et al. Figure 1: Figure 2 of the Chakrabarti et al. 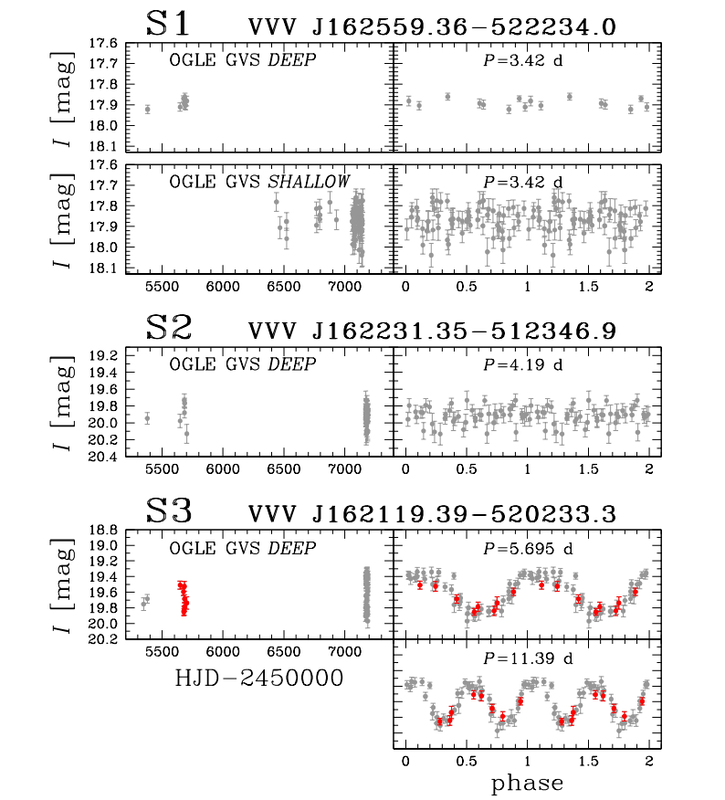 paper showing the finding charts (left column) and light curves (right column) of the four potential Cepheids that they discovered. The light curves are in the Ks-band from the VVV Survey. This paper notes that the finding chart for the second object is incorrect while the light curve is correct. Last February, a group of astronomers claimed to have found a new dwarf galaxy close to the plane of the Milky Way. 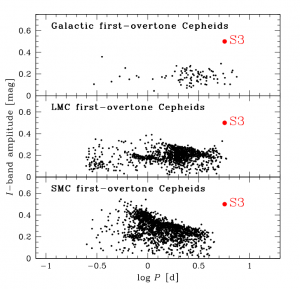 They had found what they believed to be four classical Cepheid variables clustered within one degree of each other at a distance of 90 kiloparsecs and a Galactic longitude and latitude of l=-27.4 and b=-1.08 respectively. The authors had discovered these Cepheids using Ks–band (2.14 µm) data from the VISTA Variables of the Via Lactea (VVV Survey). Cepheids are rare objects, so finding four of them in such close proximity on the sky and at that distance from the center of the Milky Way is unusual—unless, of course, they happen to be part of a previously undiscovered dwarf galaxy. The lightcurves for these objects are shown in Figure 1. This paper was unusual and exciting not only because it could potentially have helped bring us closer to resolving the anomalies of the missing satellites and the too big to fail problem, but also because the authors claimed to have discovered a dwarf galaxy using Cepheids they had discovered in the near-infrared, very close to the Galactic plane. Both of these happen to be fairly novel methods for discovering Cepheids and dwarf galaxies. Cepheids have bigger amplitudes in the optical bandpasses, so data from optical wavelengths are usually used for finding them, although a few recent papers have tried to look for them in the infrared. This group of astronomers chose near-infrared, however, because it is less sensitive to dust. This was useful since they were looking close to the dusty plane of the Milky Way. And here is where the “cautionary” part of our tale comes in; just a few weeks ago, another group published a response to the dwarf galaxy discovery paper. This response paper is the focus of today’s astrobite. 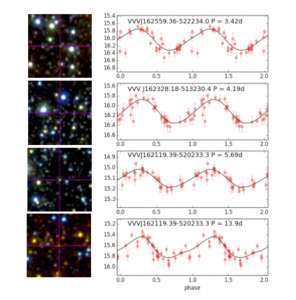 The authors had looked at the four objects discovered in the previous paper and found that it was likely that none of them were Cepheid variables. Moreover, two of the objects appeared not to be variable stars at all. How can this be? Figure 2: Figure 2 of the paper depicting the I-band light curves (with data from OGLE GVS) of three of the objects. The first two objects appear not to be variable, whereas the third may have experienced an amplitude change since 2011. The points from 2011 are plotted in red. First, let’s take a look at what the authors of this paper found. Figure 2 from their paper shows the light curves in the I-band of three of the four objects reported in the previous paper. This data was taken from a different survey, the OGLE Galaxy Variability Survey (OGLE GVS) and folded with the periods (you can think about this as taking the time-series data and plotting it mod the period) given by the previous paper. The objects are referenced by the names they were given the discovery paper, S1, S2, S3, and S4. As we can see from Figure 2, S1 and S2 seem not to be periodic with the periods listed in the first paper. In fact, they are most likely not periodic at all. Their power spectra, shown in Figure 3, reflect this as well, in addition to showing no presence of any other periodicity. Figure 3: Figure 3 of this paper showing the ANOVA power spectra of S1, S2, and S3. 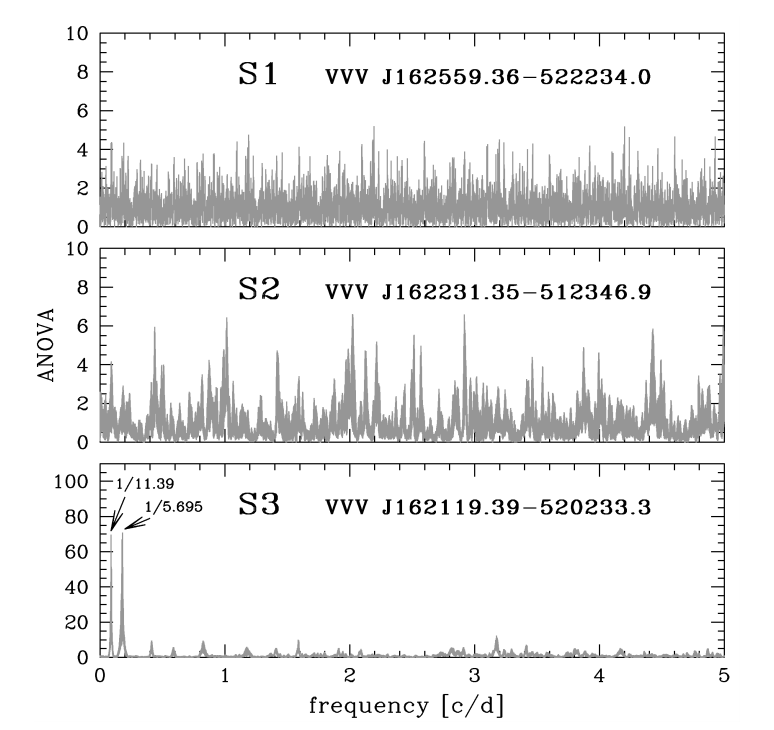 No strong signal appears in the spectra of S1 and S2, indicating that there is no variability, but there are peaks at frequencies corresponding to periods of 11.39 and 5.695 for S3. S3 on the other hand, does seem to be variable with the period given in the previous paper, as can be seen in both its light curve and its power spectra in Figures 2 and 3. However, the shape of its light curve doesn’t match what would be expected from a classical Cepheid with its period (see Figure 4 for some comparisons with other Cepheids). 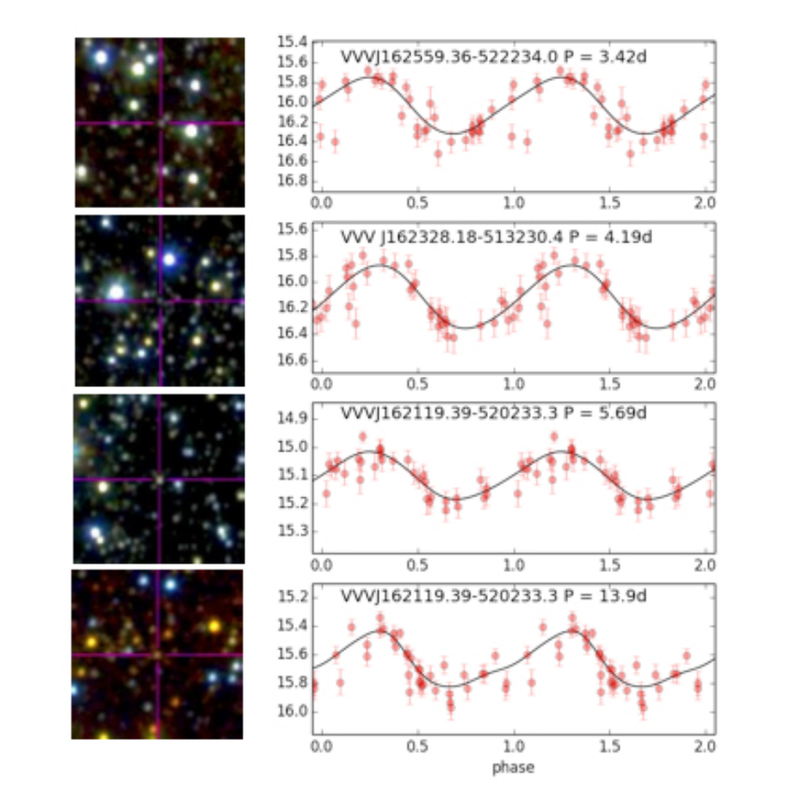 This paper suggests instead that S3 might be a spotted star. Even if you haven’t spent much time reading about astronomy, you’ve probably heard of sunspots. Starspots are the same idea (except on other stars besides the Sun) and cause non-variable stars to look variable, depending on how “spotted” a star happens to be. A spotted star is one that has much more variability than the Sun, to the extent that it could reproduce the variability that is shown here. This sort of variability changes over the course of years, but can look constant on short time scales, like the time scale of the data in the previous paper. 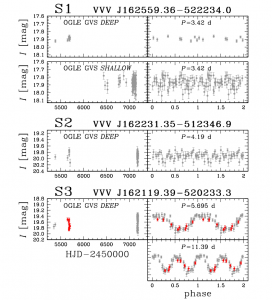 Finally, S4, with a period of 13.9 days, was found to be too faint to be detected in the OGLE GVS, so the authors of this paper were not able to look at this object in the I-band as they did with the others. 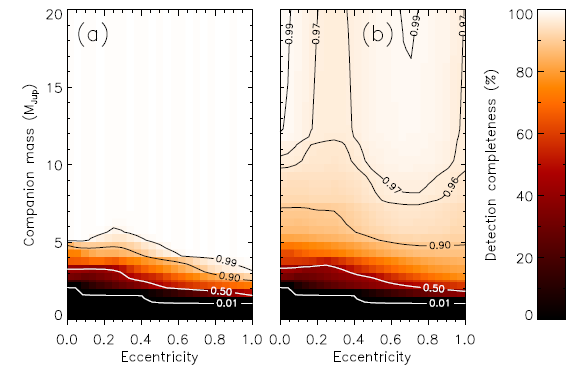 Based on the light curves shown in the first paper, however, they deem that the shape is very different from what one would expect—Cepheids longer than 10 days have near-infrared light curves that are more sinusoidal in shape than the sawtooth-like pattern shown in the original paper (although the sawtooth pattern is characteristics of shorter-period Cepheids). They then conclude that S4 is likely not a Cepheid either. Figure 4: Figure 7 from this paper showing the period-amplitude diagram for Cepheids from our Galaxy (top), the LMC (middle), and SMC (bottom). S3’s period and amplitude are plotted in red and it appears to be an outlier from every sample of Cepheids. So what can we learn from all this? Well, first and foremost, we have to be careful when searching for Cepheids in the infrared. And, just last week, another astrobite discussed the difficulty of disentangling stellar effects, like sunspots, from the presence of a planet. It’s probably worth thinking harder about what conclusions we draw when we have a massive amount of data and a few unusual objects in it that meet our criteria. They might not always be what we’re looking for. Thank you, Caroline, for a very interesting astrobite. Fascinating, and a beautifully mature approach to data analysis.